With one-on-one parental assistance and guidance from our staff, tots develop gross motor skills, coordination, balance, strength and body awareness by jumping, swinging, climbing and tumbling in a safe and stimulating gymnastics environment. Children are encouraged to explore a variety of movement activities that will build self-confidence and greatly improve future fitness. Fun and fitness is the emphasis, yet we always encourage proper positions and techniques. This class will prepare children to proceed in our sequential gymnastics program. Girls 9 & up, or younger girls ready to move up from beginners. 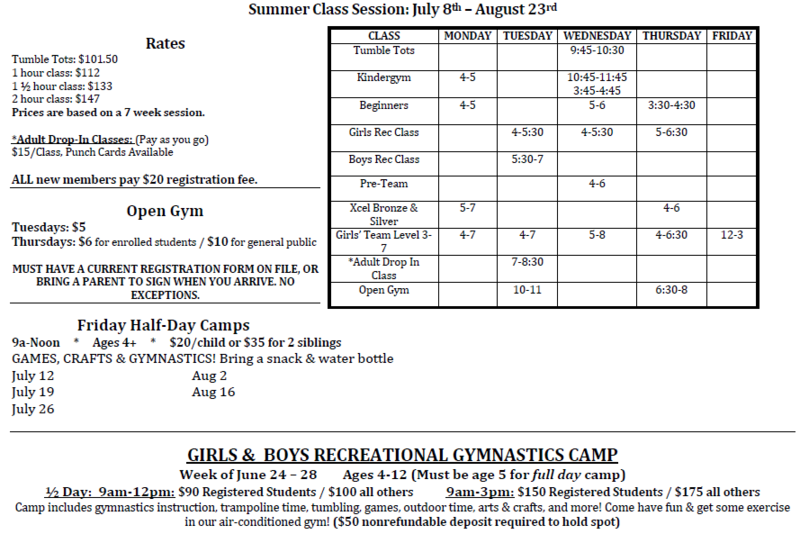 Basic skills to USAG Level 1 routines in all four events (Vault, Bars, Beam and Floor) are taught in this class. This class is ideal for girls who wish to stay in the recreational program, yet who are ready to move on to more advanced skills. This is also a good preparation for girls who wish to move into our competitive team program. Girls wishing to be invited to join the Team program are encouraged to take this class twice a week. In addition to basic tumbling skills, boys will explore events specific to men’s gymnastics, such as rings, high bar, pommel horse, etc. This class is ideal for boys wishing to participate in recreational gymnastics or for those who wish to move on to competitive gymnastics. For teens and adults who want to get fit the fun way. Includes stretching, strengthening, tumbling and more! $15.00/class. Punch cards available. Registration fee required. Tuesdays 10-11am, $5 for all. Thursdays 6:30-8, $6 for currently enrolled students or $10 for the public. ALL PARTICIPANTS MUST HAVE A CURRENT REGISTRATION FORM SIGNED BY A PARENT. NO EXCEPTIONS.